You must enter information, including zip code, to find nearest club and generate a guest pass. Come into clubs and redeem this Five Day Pass for you and a friend. All guests must prove that they are at least 16 years of age (or at least 13 years of age and accompanied by a parent or legal guardian) and sign a waiver of liability to use club facilities; a parent or legal guardian must sign the waiver of liability on behalf of guests under 18 years of age. A current picture ID (with birth date) must be presented for admittance to the facility. This guest pass must be activated within 30 days from the date emailed and once activated at the club, the pass is valid for 5 consecutive days for you and a friend. Passes issued for over 1 month will not be honored. Limit of one pass per person every six months. 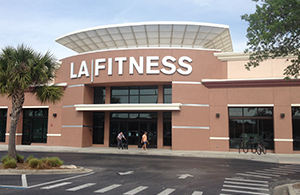 Guests cannot use consecutive passes for admittance to the facility or other LA FitnessCity Sports locations. A fitness analysis must be filled out and guest must have an orientation with a membership counselor before using a pass. Membership and/or personal training options may be presented. Amenities and classes may vary by club. Not available for resale or redeemable for cash. This pass cannot be sold or listed for sale on-line auction sites such as eBay or uBid. Any such sale or listing is prohibited and will void the pass. LA FitnessCity Sports is working in conjunction with the police department to insure that no acts of misconduct occur within the facility. Health Studio Registration DetailsFitness International, LLC is registered in the state of Florida as a health studio, registration numbers HS3536, HS3766, HS3951, HS4130, HS4182, HS4217, HS4471, HS4516, HS4675, HS4845, HS4934, HS4939, HS5111, HS5681, HS5793, HS5810, HS5819, HS5825, HS5931, HS6150, HS6926, HS7147, HS7159, HS7339, HS7740, HS7838, HS7894, HS8088, HS8092, HS8226, HS8496, HS8852, HS4793, HS4844, HS4915, HS5217, HS5939, HS5974, HS7231, HS7403, HS7803, HS9527, HS9943, HS6646, HS6647, HS6889, HS7804, HS8581, HS7853, HS9392, HS9425, HS9482, HS9788, HS6922, HS7177, HS7516, HS8851, HS9470, HS9530, HS9511, HS9526, HS10024, HS9303, HS9304, HS9299, HS9327, HS9300, HS9310, HS9301, HS9309, HS9552, HS9618, HS9551, HS9555, HS9563, HS9548, HS9550, HS9549, HS9556, HS9559, HS9554, HS9564, HS9561, HS9543, HS9542, HS9541, HS9567, HS9546, HS9544, HS9547, HS9540, HS9570, HS9558, HS9560, HS10148, HS10227, HS10139, HS10190, HS10538, HS9526, HS9483, HS10564, HS10565, HS10566, HS10259, HS9565, HS3951, HS10769, HS10770, HS10777, HS10567, HS10345, HS10993, HS11248, HS11321, HS11355, HS11957, HS12232, HS12361, HS12555, HS12729, HS12725, HS13150 and in the state of Texas as a health studio, number 080543. ©2019 Fitness International, LLC. All rights reserved. (1) Assumption of Risk. Use of any facilities, services, equipment or premises at a fitness club (collectively, “Facilities”) involves risks of injury to my person and property and to the person or property of any minor for whom I have guardianship and have requested or allowed entry to or use of such a club (including the use of “Kids Klub” services) (a “Minor”); by engaging in such use, or by permitting such use by a Minor, I voluntarily accept and assume full responsibility for such risks. (2) Waiver of Liability. Fitness International, LLC, its successors, affiliates and related entities (including Fitness & Sports Clubs, LLC and LAF Canada Company), and their respective directors, officers, members, managers, employees, volunteers, independent contractors, and agents (collectively, "FI") will not be liable for any injury to my person or property or to the person or property of any Minor. On behalf of myself, my heirs (including any Minors), personal representatives and assigns, I hereby release, discharge and hold harmless FI from any and all liability and claims arising from my use, or any Minor’s use, of the Facilities, including, but not limited to, all liability and claims arising from personal injury (including death), accidents or illness, and damage to, loss of, or theft of property, whether caused by the active or passive negligence of FI, and I covenant not to sue FI with respect to, and I waive any and all claims that I may have now or in the future against FI for, any liability arising from my use, or any Minor’s use, of the Facilities. This paragraph (2) is expressly void and unenforceable and not a part of this agreement in New York and Massachusetts. (3) Authorization to Contact. By providing my phone number or e-mail address, I authorize the operator of this club or its affiliates to contact me regarding promotions or special events, regardless of whether I am on a Do Not Call registry. I further understand and agree that I may not use any of the Facilities at this club unless I am an authorized guest of either a member or a permitted vendor, or unless specifically authorized by club staff. Some restrictions on my ability to use the Facilities may apply. If any provision above is null, void or unenforceable under applicable law, it shall be deemed omitted and shall not apply, but the other provisions above shall remain in effect. I, acknowledge that I am of legal age and I hereby consent to the use of an electronic signature to record my agreement with the terms of this Guest Pass as of Friday, April 26, 2019. By providing your contact information above and printing this pass,you are authorizing LA Fitness City Sports Club to contact you.